Abstract: Hinterland networks for container transportation require planning methods in order to increase efficiency and reliability of the inland road, rail and waterway connections. In this paper we aim to derive real-time decision rules for suitable allocations of containers to inland services by analysing the solution structure of a centralised optimisation method used offline on historic data. The decision tree can be used in a decision support system (DSS) for instantaneously allocating incoming orders to suitable services, without the need for continuous planning updates. Such a DSS is beneficial, as it is easy to implement in the current practice of container transportation. Earlier proposed centralised methods can find the optimal solution for the intermodal inland transportation problem in retrospect, but are not suitable when information becomes gradually available. The main contributions are threefold: firstly, a structured method for creating decision trees from optimal solutions is proposed. 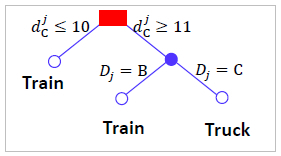 Secondly, an innovative method is used for obtaining multiple equivalent optimal solutions to prevent overfitting of the decision tree. And finally, a structured analysis of three error types is presented for assessing the quality of an obtained tree. A case study illustrates the method's purpose by comparing the quality of the resulting plan with alternative methods. Reference: B. van Riessen, R.R. Negenborn, R. Dekker. Real-time container transport planning with decision trees based on offline obtained optimal solutions. Decision Support Systems, vol. 89, pp. 1-16, September 2016.